Wren McMurdo, an intuitive artist in Seattle, Washington, has been studying tarot for ten years. An illustrator since early childhood and a devoted subscriber to the practice of witchcraft, her Dark Days tarot deck is a passion project a lifetime in the making. Inspired by the push and pull of her muse, the moon, Wren created this deck by channeling her Cancerian connection to the moon and its phases, placing special emphasis on the dark moon phase. She finds joy and inspiration in her beautiful wife Schquay and her two parakeets, Julia Roberts and RuPaul. A full-time freelancer turned full-time in-house writer, Wren’s ambition knows no bounds. She actively engages with clients, peers and shoppers online; she manages a myriad of social media platforms with poise and professionalism; she keeps artistically limber by creating artwork and comics on commission. Drawn in by the cloying illustration and beautiful aesthetic of this Seattle-born deck, Pif caught up with Wren to learn more about her life, her journey and her process. Tell us a little about you; what’s your backstory? In high school I connected with a therapist that identified as a feminist. She taught me the radical notion that my feelings are beautiful reflections. She taught me about the moon and its cycle. I discovered that earthly beings flow with or against its currents, which are expansive at times and reflective at others. I felt profoundly freed by this realization that I’ve been in love with the moon ever since. It was trauma that led me to study the craft. Hiccups with my health led me to study herbalism, which then led me to study natural magic, and also to learn about the healing power of herbs and stones. I’d collected these things since childhood but hadn’t understood why until I read about witches. My mother is a genealogist, so naturally she has delved into the stories of my relatives. I was both shaken and intrigued to read the story of my Great Grandmother Anna Jenkins, who lived a tragic life that she infused with spellwork, as is evidenced by the notes she jotted in her books. She had been cast out of her community for becoming pregnant out of wedlock. Her life was a hardworking and solitary one. She raised my grandfather, a water witch (he was able to find water sources with a coat hanger). Her lover must have promised to return. When he finally did the Great Depression and a good percentage of her life had past. She was an ever-aching soul after waiting for so many years. In the end, she was hospitalized for mental illness and died from the treatments she endured within hospital walls. My Great Grandmother’s story is close to my heart, and it lives in my cellular memory. My struggle with mental health has taught me to give pain space to exist. I honor the pain she survived and endured in a world that unjustly punished and continues to punish women. She inspires me to honor those who need to know their own magic more deeply, so that they can heal old wounds. I’m grateful for my mother, Jenny McMurdo, who preserved Anna Jenkins in storytelling. Can you tell us a little about your early work and development as an artist? I had moved to LA to attend the Fashion Institute of Design and Merchandising. I was focused on androgynous fashion then, having been inspired by the Seattle and Los Angeles queer scenes I’d fallen for. That’s how I met my now-wife Schquay Brignac, who was at the time a designer specializing in clothing for masculine-of-center studs. Schquay prayed to her ancestors on the floor by our bed with candles and coins among photos of relatives past. Her devotion to spirituality and meditation did then and continues to inspire me. She took me to the Agape Church and Lake Shrine. It’s hard to NOT be a woo in Los Angeles. I found myself alone a lot. I had only a handful of friends due to the transient nature of the city. Everyone I connected with initially would eventually drift away, except for Quay (now my wife). She was born and raised in the area so we’d decided to move in together. In my solitude I played in my imagination and enjoyed Los Angeles woo culture. I began working with Tarot deck on a daily basis. My altar went up on our back deck. Magic was something I discovered about myself. My fashion illustration teacher had said to “love my girls.” She taught fashion illustration and reminded me of a Hogwarts teacher in her style and drawing technique. Her fingers became wands and her posture very confident as she penned gorgeous illustrations. 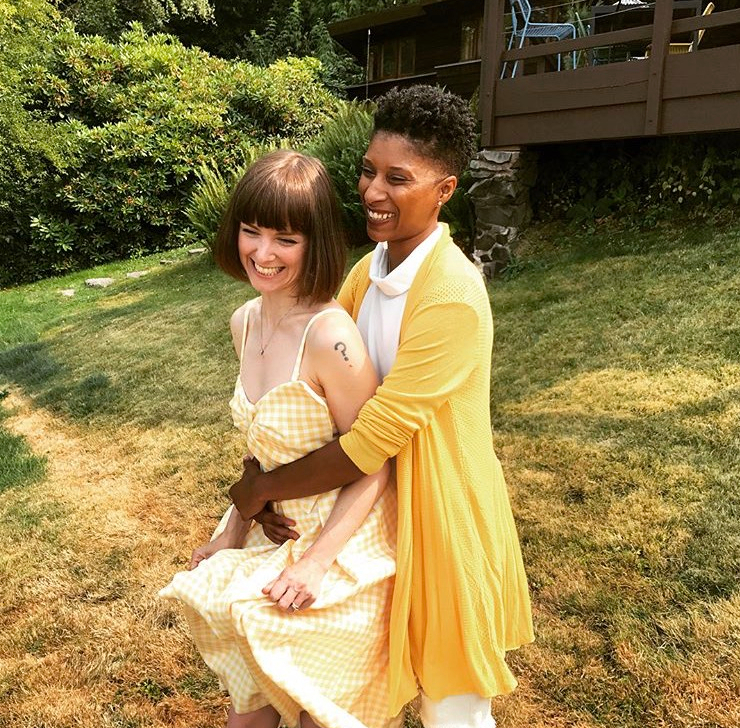 I had a fabulous job as a fashion designer, but when Quay randomly got a job in my hometown, Seattle, I found myself eager to quit that job and move home with her at the drop of a hat. I hadn’t lined up another position before moving, and finding one proved painstakingly harder than I’d predicted. I eventually took a decent gig in the food service industry and began to stick to a personal goal: to publish an illustration each week. These “WrenCoMcs” taught me the confidence and discipline I needed to complete my Tarot deck. Okay, so we’ve got the background. Now, Dark Days: how did this come about? Dark Days actually began as a chocolate company. I got the wild idea to wrap monthly comics around chocolate bars. The treats, which evolved into coconut-filled moon patties, were infused with dark moon-inspired supportive herbs. They were meant to heal from within, and were lovingly known as Dark Days Moon Patties. Sadly, the illustration became less of a priority as the chocolate business progressed. After many hours of patty production in less-than-appealing commercial kitchens, I learned that I was not my best self in the role of chocolatier. I also found that starting a confection business from the ground up would require me to spend much of my time in this role. I would have to pivot. I began the Dark Days Tarot Deck during Mercury retrograde. I knew that my customers were inspired by the lunar connection that Dark Days Moon Patties provided. During one rather emotional mercury retrograde period I was huffing and puffing over having to make chocolate patties when I decided to chill out with my drawing pad. I was already creating moon “mood guides” for my Dark Days Moon Patties Instagram page, so I had some drawing to do anyway. The idea hit me then: Each week I would pull a card, interpret it in line with lunar insights and my own visions, and produce my own illustrated Tarot Deck, one illustration after another. As time passed my speed increased and I went from producing a card a week to a card a day. The more I illustrated, the faster and more tuned in I felt. The figures in the cards seemed to be appearing to me from somewhere. I began to share the cards with my audience while letting my attention divert from chocolate production. I sold my chocolate equipment and managed to get my business back in the black. My community began to urge me to launch the Kickstarter campaign I’d been planning, so I did, and it was a wonderful success thanks to connections I’d made while building my chocolate business. My employment in food service put me in contact with ripe creative minds galore. I befriended a lyrical and sophisticated young writer & magical mind, Emily Mundy, whose elegant and probing prose became the contents of the chic little guidebook that currently accompanies the Dark Days Tarot deck. Another powerful connection was made by my friend Colleen Twombly-Borst, who put me in touch with Beth of the famous Tarot blog and shop, Little Red Tarot. Beth invited me to run an article about my campaign, which helped enormously in getting it funded. What can your fans expect to see from Dark Days in the future? This company has become an essential part of my life and partnership. I am so grateful for my readers and those who work with the Dark Days Tarot Deck. It’s such an honor and blessing to be so connected to your magic. I still have some Tarot decks in stock, so be sure to snag yours while they’re in. I’ve begun drafting ideas for my next deck which are currently being hung all over Seattle in the form of the Capitol Hill Art Walk posters (shhh!). Be sure to sign up at the bottom of this page to stay updated on my current and future offerings while taking in witchcraft and Tarot tips and tricks. Wren would also like to acknowledge an esteemed collaborator on her passion project, poet and writer Emily Mundy. Follow Wren and her artistic pursuits on Instagram, Facebook and Twitter, too, to keep abreast of upcoming decks and to learn about the release of her updated Dark Days Tarot Guidebook (penned by the artist herself).